The Henge marks 450 years since Queen Elizabeth I granted the Fief of Sark to Helier De Carteret, Seigneur of St Ouen, on 6th August 1565. Stones of Jersey granite form a ring about the Seigneur to greet and thank their settler ancestors in St Ouen. ‘One-eyes giant’ stones are found in many ancient cultures, used to track the sun and also as portals for love tokens. Whatever their original purpose, the stones were used by Helier’s tenants to enclose their fields. Set horizontally in walls, the slabs formed gate hinges or hangers (henges). Nine is the number of medieval ‘territories’ in which Helier’s 40 tenements were sited: Fort, Moinerie, Ville, Valette, Avant le Creux, Dixcart, Bourel, Beauregard, Petit Sercq. The circle divides by 40, giving 9 degrees of arc to each of the 40 men (quarantaine) gathered about their lord. His central disc stone is a pilotin, formerly used to support a granary or hayrick. Each of the group of nine (‘Ennead’) is aligned with a landmark (St Ouen’s, L’Etac, La Coupee, the Seigneurs Mill, Alderney) or by the sun. The solstice line SE/NW marks winter sunrise/summer sunset; orientation E/W is to the spring/autumn equinox. 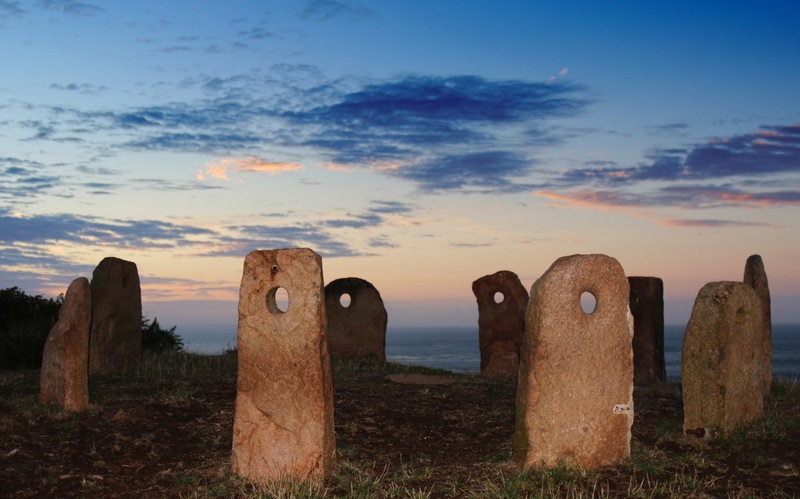 Many secret meanings of Sark Henge remain to be discovered. by Richard Axton, La Societe Sercquaise.